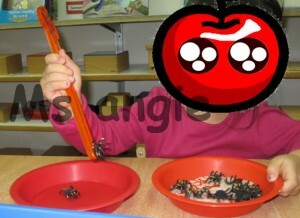 The child in the picture is working transfer objects with chopsticks. Transfer bigger objects that cannot put into mouth with spoon would be age appropriate. Development of Motor Skills are one of the area in Montessori Practical Life. One of the sector is transferring. I designed this activity for matching the theme “Halloween”.This is a fun transfer activity. You can buy the little spiders from toy shops. 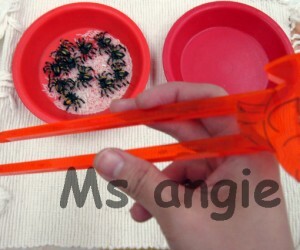 The chopsticks are perfect for the little child to hold and grab the spider’s legs! My students love working with it very much. Have your child/children to transfer the objects from L to R.
Don’t put too many objects for the young child to transfer in the first time coz they don’t have very long attention span to complete the task. If the child cannot hold the chopsticks correctly you may consdier choose another transferring tool which is easier to hold. You may ask your child/children to transfer certain number of objects that you’ve named or written. Introduce the activity and the name of the material to the child. Show the child how to hold the chopsticks. Transfer the little spider from left to righ until the left container no more spiders left. Then transfer back.